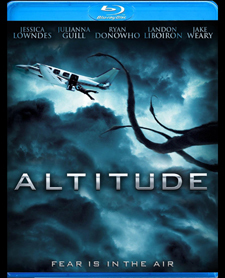 Synopsis: After a mysterious malfunction sends their small plane climbing out of control, a rookie pilot and her four teenage friends find themselves trapped in a deadly showdown with a supernatural force. Review: This is the debut feature film from award winning comic book writer Kaare Andrews. What you get here is a basic plot about 5 friends (1 of them is a pilot) who go on weekend getaway and end up renting a plane and all hell breaks loose into their trip and takes a turn into a nightmare that beyond belief. To me the story in this film for the most part is nothing new, but I can say that there is a twist in the story that I did not see coming and when it does come trust me you will be surprised. For the most part I did like the cast even though I thought some of the acting could of been toned down especially for the character Sal. There is some great moments of suspense that are quite intense and will push you to the edge of your seat. There is not really much more I could honestly say about this film other than that this is a good debut effort for Kaare Andrews and it also shows that this director shows alot of promise for future films. Overall this was a good film that deserves at least 1 viewing.